Choose This Table If You're on the go with a lot of out calls You want a compact, easy to carry quick-open table You travel by air (no extra luggage charge for this size) Your mode of therapy requires you to be close to the client Low cost is a priority for you STANDARD FEATURES Working Surface: - 22" x 69" (Please note narrow width) - 1/8" Baltic birch table top - Quick-open CenterLockTM leg design - 2 1/2" Double-wrap foam. Weight: 24 lbs. 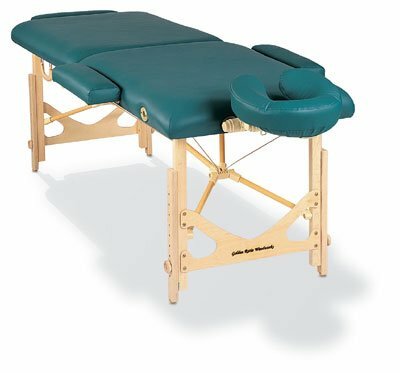 (23 in UltraLeather) - Adjustable maple legs 24" to 34" - Holes at both ends for accessories - Holes for included side arms which are 15" L X4" W. - 5-year structural guarantee. Includes $110 Deluxe Facespace II Headrest with pillow and $100 travel bag.Clearance Sale- Almond/White colors only, subject to change. If you have any questions about this product by Portalite, contact us by completing and submitting the form below. If you are looking for a specif part number, please include it with your message.